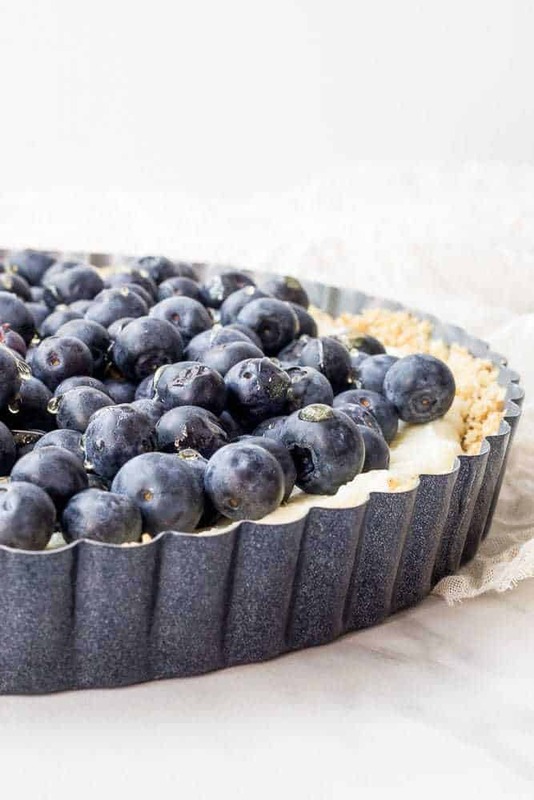 This blueberry white chocolate tart features a no-bake crust and luscious mascarpone cheese. It’s perfect for the Fourth of July. With Independence Day just around the corner, I should be thinking of all the patriotic-themed foods I should be making. But since my son’s birthday also happens to fall on July 4th, all I’m worried about is how we’re going to make the day special. Granted, he’s only turning 3, so special is an easy task and usually involves bubbles. The house we’re building is very close to where our town sets off fireworks, so we’re planning to hang out at the pond across the street and see what the view is like. Our festive meal will actually be very simple, with picnic fare and frozen custard. But, if I were hosting a big ol’ party? This blueberry white chocolate tart would definitely be the star of the dessert table. You know I love blueberries and white chocolate together — these blueberry white chocolate cookies are a top recipe here. There’s just something about the way blueberries and white chocolate taste together. It’s sort of like how great peanut butter and milk chocolate are when paired up, in my opinion. This tart uses a no-bake crust, so you can make it in advance and just keep it in the fridge until you’re ready to eat. I’ve chosen to use coconut oil rather than butter, but feel free to use butter if you like. Mixed with the white chocolate is mascarpone cheese for a creamy, sweet filling. I like to make my own mascarpone to use for recipes, such as my mascarpone pancakes, but you can just as easily purchase it at the store. Mascarpone is usually found among the “fancy” cheeses at the grocery store, or sometimes with the cream cheese or ricotta. Cream cheese will do if you can’t find mascarpone, but I highly recommend seeking it out! Feel free to change up the fruit for this tart. Try raspberries, strawberries, or a mixture of your favorites. This would also be fantastic with roasted peaches, especially with the honey drizzled on top. This no-bake blueberry white chocolate tart features luscious mascarpone cheese for a delightful summer dessert. 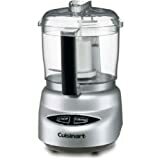 In a food processor, pulse almonds until broken into small crumbles. Add graham crackers and pulse again until crumbs are small and uniform. With the processor on low, stream in the melted coconut oil and let mix just long enough to moisten the crumbs. Pour crumbs into a tart pan and press evenly along the sides and bottom. Put pan into the refrigerator to chill. In a microwave-safe bowl, melt white chocolate chips in 20-second intervals, stirring after each time, until completely melted and smooth. Let cool 5-10 minutes. Whisk mascarpone cheese into the melted chocolate until completely smooth. Remove tart pan from refrigerator and pour in cheese mixture, spreading evenly. Arrange blueberries on top of cheese mixture. Warm honey slightly, then drizzle over the top of the blueberries. Return tart to fridge to chill for at least 2 hours before serving. Welcome to Progressive Eats, our virtual version of a Progressive Dinner Party. This month we’re featuring Summer Bounty, hosted by Laura Kumin, who blogs at Mother Would Know. Our theme features fresh vegetables, herbs, and fruits associated with summer in a menu that we hope you’ll enjoy! Blueberries? White Chocolate? Mascarpone????? Sign me up for a BIG slice. This sounds amazing!!! P.S. Happy #3 to your sweet boy!!! This looks amazing and is on my must try list! There is absolutely nothing about this that I don’t LOVE! So beautiful and adding white chocolate to the mascarpone is brilliant. I make a similar raspberry-topped tart, but these blueberries are stunning. Perfection! I’m always on the look-out for no-bake desserts during the summer and this one is definitely a winner. Please tell your son that it may be tough having a birthday on July 4th, but he should think of the fireworks and other celebrations as all for him. What a stellar way to celebrate blueberries! This looks like the perfect dessert at the end of a hot summer day. And the mascarpone is a huge win with me!!! Bubbles are enough to make ANY day special! This looks amazing, beautiful and rustic…perfect for the 4th. Totally making this tomorrow! What size tart pan did you use? @Allison, It’s a a standard 9-inch tart pan. I hope you like it! Does the white chocolate/mascarpone mixture harden or stay creamy like cheesecake texture? Curious because I thought it would be cheesecake texture, but it has hardened in the fridge. Sure it will be delicious either way! 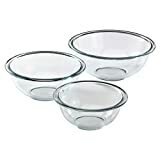 @Becky It hardens but should not be brittle – it should be soft enough to easily cut and serve. Ooooooh this looks divine, says the woman with a ton of blueberries in her fridge. All flavors I love combined in one luscious tart; perfect!